Travel agents have heaped praise on Etihad after one of its pilots turned a flight around to allow a couple to race to their dying grandson's hospital bedside. Travel Counsellor Becky Stephenson from Bradford publicly thanked the airline on the travel industry Facebook page Travel Gossip for the 'over and above customer service' it provided to her clients. The couple, who were on their way to Australia via Abu Dhabi to see family, were about to turn off their mobile phone as their Etihad flight taxied to the runway at Manchester airport when they spotted they had a message from their son-in-law. When they quickly called him back to say their flight was about to take off, they were told their grandson had been rushed to intensive care. "They alerted the cabin crew who managed to get a message to the pilot as the plane taxied to the runway," Stephenson told TravelMole. "He took the decision to return to the gate so the couple could disembark, but not only that, the crew also arranged for the couple to be assisted at the airport and they even got their car delivered from the car park. "Everything little thing you could think of, they took care of. Sadly my customers' grandson passed away the day after but had they not been allowed off the flight and had to fly back from Abu Dhabi they may not have made it to his bedside." Her post on Travel Gossip received a lot of interest and more than 60 comments, most of them praising Etihad. Agents said the airline was 'truly amazing' and described the story as 'heart-warming'. "I'm pleased that, via the power of social media, Etihad has got the recognition they deserve for their really excellent customer service," said Stephenson. She has also managed to contact the Etihad crew to thank them personally and to let them know the couple made it to the hospital in time to see their grandson. Etihad has said the couple can re-use their tickets to fly at another time. 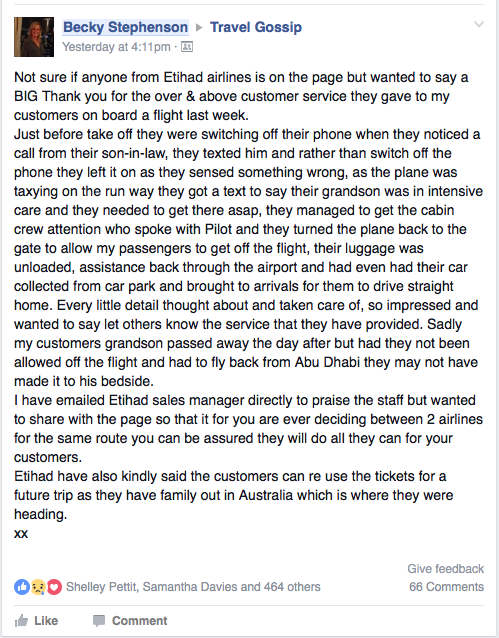 Too many times we hear of bad customer service, but hats off to Etihad! I've flown with them twice now and recommend them. Sorry to hear about the grandson, it's always sad to hear a young person passing away.